now reading: New York: Best Mass Transit in the Country? New York: Best Mass Transit in the Country? New York's transit system is the lifeblood of America's largest metropolis. Comprising subways, commuter trains, and ferries, it's famously vast, and millions of commuters rely upon it every day. Salt Lake City's is . . . not. Utah's capital features light rail, bus rapid transit, and even a commuter rail line. But these transportation options -- many of which are less than a decade old -- are hardly integral parts of the city's identity. But not so fast, spoiled New Yorkers. Salt Lake's relatively modest transit network actually outperforms its New York counterpart on one essential measure: providing access to a high percentage of the region's jobs. That's according to data in the Access Across America report, the latest by transportation planner David Levinson and the Accessibility Observatory at the University of Minnesota. The study, which ranked urban areas by their transit systems' ability to provide access to jobs, revealed some surprising truths about the impact of mass transit on urban mobility. 1. Percentages tell a different story. Levinson and his colleagues ranked 46 of the largest American Metropolitan Statistical Areas (a definition used by the Census Bureau) by the number of transit-accessible jobs in the urban area in six different increments of time -- from ten minutes to one hour. The calculations were "worker-weighted," meaning they accounted for the actual residential patterns of each city. In terms of raw numbers, New York was the victor in every time segment, with 1.2 million jobs reachable in one hour. In fact, there was an incredible amount of consistency among a core group of cities -- New York, Chicago, San Francisco, and Washington, D.C., all finished in the top five every time. That should come as little surprise, given that those four cities are among the densest and most transit-reliant in the country. Conversely, Birmingham, Ala., and Riverside, Calif., were in or near the bottom of the list every time. Salt Lake's first-place finish is well deserved -- a one-hour commute on mass transit puts Salt Lakers in reach of an incredible 25.42 percent of the region's jobs. New York? Just below 15 percent. 2. It pays to think regionally. Even more amazing than Salt Lake's ranking in the study, however, is the fact that those 129,000 transit-accessible jobs can be reached using just one agency: the Utah Transit Authority. In achieving this, Salt Lake was not alone. Of the five top-ranked urban areas in the one-hour category (ranked by percentage of accessible jobs), three have just one major transit agency. It may seem counterintuitive, but it's a fact that speaks to the power of strong regional planning on issues of transportation, especially when addressing longer commutes, which are more likely to cross jurisdictional boundaries. Unlike Riverside, say, where the transit systems are separated by county lines, Salt Lake, Milwaukee, and Buffalo can better coordinate their bus schedules to optimize commutes. A unified transit system is not a panacea -- poor-performing Birmingham also has just one -- but it can go a long way toward improving regional job accessibility. 3. Population density doesn't play as big a role as you might think . 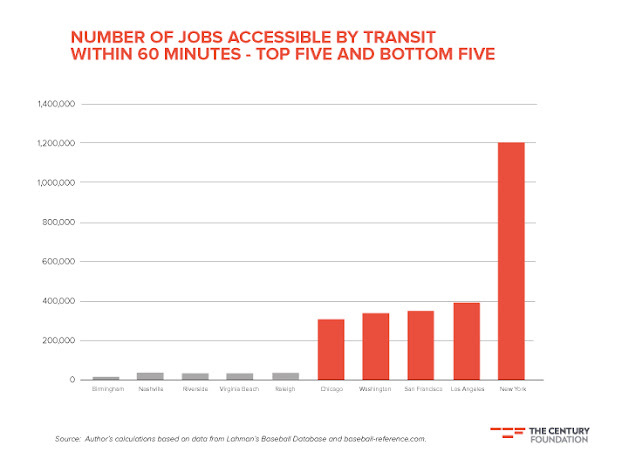 . .
About 8 percent of jobs are transit-accessible within an hour in the Los Angeles area, for example. That's roughly the same as greater Cleveland, which is only one-third as dense. 4. . . . but investment in heavy rail does. Population density is, of course, just part of the equation. The kind of transportation used to commute also has a major impact on job accessibility. Looking at the raw number of accessible jobs, the urban areas that "outperform" their counterparts of similar densities tend to have established, extensive heavy-rail systems. The Boston area and greater Kansas City have roughly the same population density, for example, but an hour on mass transit will take a commuter up to five times more jobs in the former than in the latter. The Washington, D.C., area has a population density below that of New Orleans, but its subway-centric transit network can reach ten times more jobs in one hour. Interestingly, though, when looking at job accessibility as a percentage rather than as a raw number, heavy rail is not always the reason for a city's high ranking. Heavy-rail-reliant San Francisco and New York still have an edge, but Milwaukee, Buffalo, Portland, and Denver, which lead their peers of comparable density, rank high despite having no such advantage. 5. People like to stick to their cars . . .
Perhaps the most interesting element of the study, however, is the relationship between the ideal situation it describes and Americans' actual commuting habits. In reality, most American cities have only a very meager number of mass-transit commuters, outside of a few large metropolises with well-established rail networks. This remains the case even when the city in question has a high proportion of transit-accessible jobs. Despite Salt Lake City's progress in making jobs accessible via public transportation, for example, less than 5 percent of the region's commuters use mass transit to get to work. Same goes for San Jose, ranked number two percentage-wise. 6. . . . unless everybody is taking the train. Looking at the raw numbers of transit-accessible jobs, however, the situation is quite different. 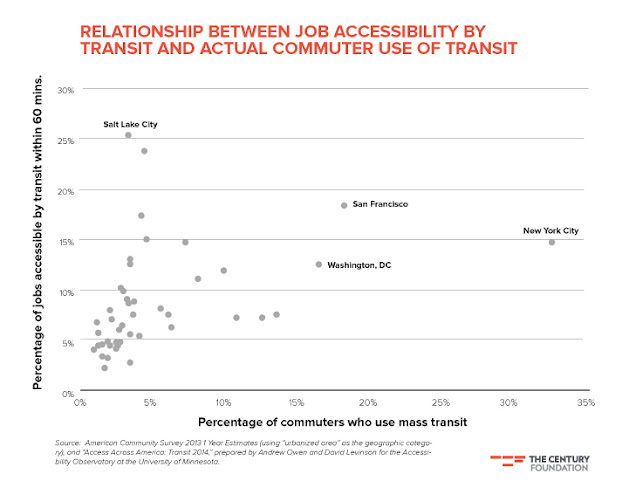 Here, there appears to be a strong correlation -- at least preliminarily -- between the total number of transit-accessible jobs in a given city and the percentage of that city's commuters who use mass transit to get to work. This is the case in both in the 30-minute and 60-minute categories. It will take a far more rigorous statistical analysis to determine if there truly is a relationship between the two measures. (For starters, the correlation is weaker when cities with very low transit usage are examined as a discrete group.) Still, it seems logical to assume that a virtuous circle exists between the sheer number of transit-accessible jobs and the proportion of people who use transit to travel to them. When transit agencies focus on moving large numbers of passengers, the frequency of trains and buses usually increases. This, in turn, improves the public's perception of transit's reliability, which encourages greater ridership. Employers, eager to have access to a broader pool of talent, continue to locate their companies close to this well-used transit network. 7. If you build it, they still might not come. Still, the report is perhaps most useful in showing that there's no magic formula for good transit investment.Salt Lake City is the perfect case in point. Thanks to regional planning that takes into account the entire Wasatch Front, the Utah Transit Authority has established a reputation as a national leader in smart mass-transit investment. Still, the city's low rates of transit ridership show that more work is needed to effect lasting change in Salt Lakers' commuting habits. New York City faces a different problem. Its residents don't need to be encouraged to use the subways and buses, but a profound lack of regional cooperation has for years harmed the city's potential for growth. New York's impressive statistic isn't that 1.2 million jobs are transit-accessible -- it's that the city managed to achieve that number despite having no meaningful coordination between New Jersey Transit, the Port Authority, and the various agencies of the MTA. For some cities, success is driven by delegating transit-planning powers to a regional body that can predict the needs of the entire urban area and plan its investments accordingly. For others, it's the existence of a local transportation culture in which people consider mass transit the default option and their car the alternative, rather than vice versa. The ideal, of course, is to find the place where those two trends intersect. But as the report shows, that ideal may be for now the most elusive destination of all. Jacob Anbinder is a policy associate at the Century Foundation, the New York-based think tank, where he writes about transportation, infrastructure, and urban policy. All graphic data is from the American Community Survey 2013 1 Year Estimates (using "urbanized area" as the geographic category), and "Access Across America: Transit 2014," prepared by Andrew Owen and David Levinson for the Accessibility Observatory at the University of Minnesota.